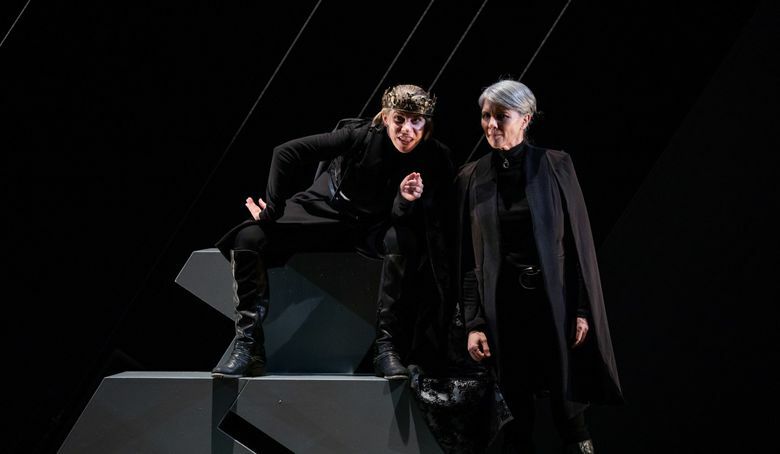 “Richard III” is a ripping good yarn when well staged. And that is the case with the blazing new airing of the classic work by Seattle Shakespeare Company and upstart crow collective. 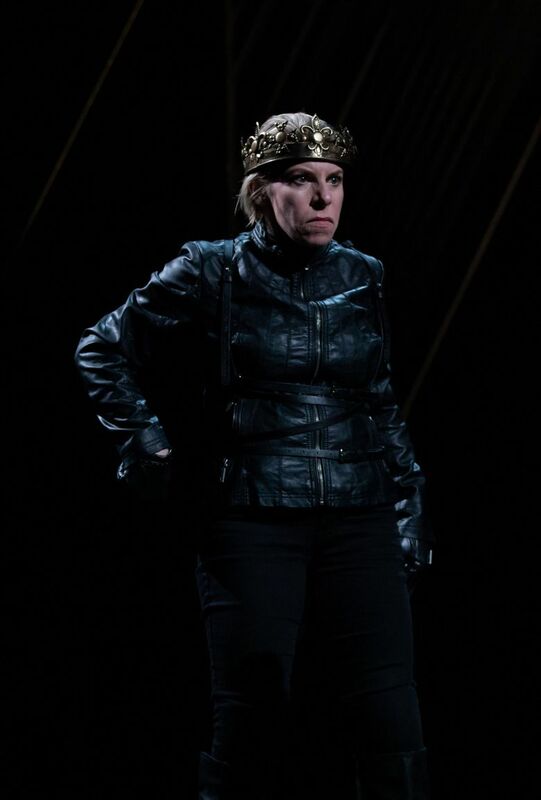 William Shakespeare’s “Richard III” is a study of power grabbing, mega-dysfunctional family dynamics and a dangerous sociopath’s diabolical mindset. Sigmund Freud considered it the archetypal saga of someone psychically wounded in childhood, and consumed by revenge as an adult. But as much as anything, “Richard III” is a ripping good yarn when well staged. And that is the case with the blazing new airing of the classic work by Seattle Shakespeare Company and upstart crow collective, at Seattle Repertory Theatre’s Leo K. Theatre. Bleak but also sleek and fleet, Rosa Joshi’s staging rarely pauses for breath as it whips us through Richard’s bloody rise to the English throne, and his precipitous fall from it. It favors breadth and pacing over psychological insight, but it still makes for exciting theater. Shawn Ketchum Johnson’s inventive set is like a giant harp: It’s adorned with metallic strings, which Richard, his supporters and adversaries periodically strum — and die upon. And lighting designer Geoff Korf’s interplay of darkness and shadow leads us through the plot’s many cul-de-sacs and intrigues. Some of the vanquished are a head or two taller than the petite Harlett. But the disparity just makes her seem like more of a weasel. The script contains many allusions to Richard’s “deformity” (in actuality a curvature of the spine, but exaggerated over time by Shakespeare and others). However, that is downplayed in Harlett’s performance, apart from one bent, useless arm held tightly to her side. The truly twisted thing about this royal is how he glories in being “subtle, false and treacherous” by manipulating others. His delighted cackle, once he’s seduced Lady Anne (Porscha Shaw), after murdering her father-in-law and husband, says it all. And later when Richard peevishly turns on his most loyal ally, the Duke of Buckingham (Suzanne Bouchard), it’s a great illustration of how the megalomania of the corrupt is ultimately self-defeating. 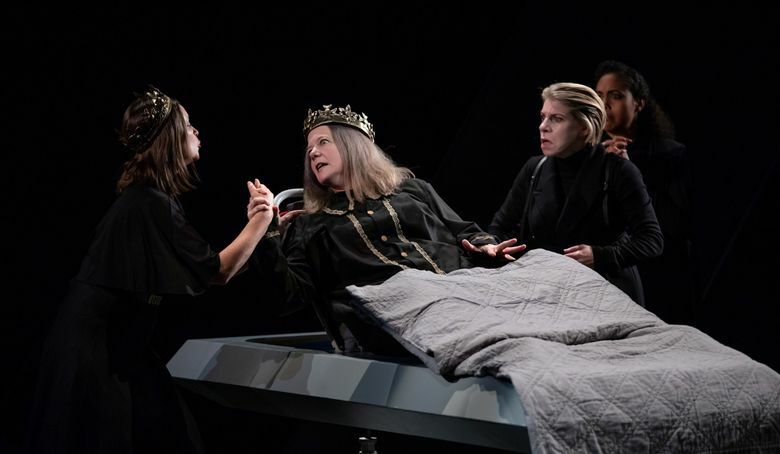 This is the second chapter in the Seattle Shakes and upstart crow collective adaptation of “The War of the Roses,” which is composed of several Shakespeare plays about the 15th-century rivalry between the House of Lancaster and the House of York. A chart could also clarify how he wronged the female characters in the play: his suffering wife Anne, his mother (standout Mari Nelson); his sister-in-law Elizabeth (Betsy Schwartz); and Margaret, the embittered widow of King Henry VI (Kate Wisniewski, another standout). In their harrowing reunion near the end of the play, the latter three are widows who rail about the misery he’s caused them and rain down curses on him. 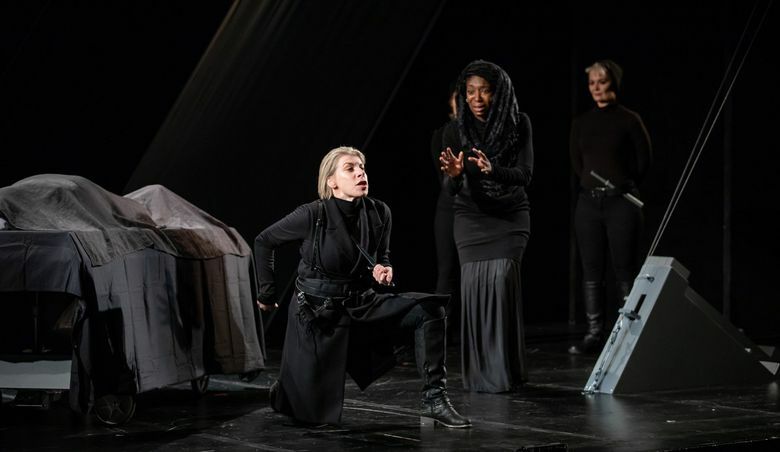 Women have some agency in “Richard III,” and they do what they can to bring down the “bottled spider,” “son of hell” and “elvish-mark’d, aborted, rooting hog” (as they fondly call Richard). But the male characters wield more power, and have many more lines. So Joshi’s commitment to giving skilled Seattle female actors a shot at these chewy classical roles is not surprising — nor is it gimmicky. After about five minutes, you buy in completely to the actors’ maleness — and, when they fluidly switch genders, their femaleness, too.